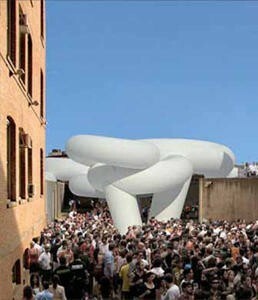 NY-based architects BSC Architecture was a finalist in MoMA/P.S.1 Young Architects Program competition. BSC Architecture was not a winner but designed a very interesting and beautiful pavilion. For more than a decade, the annual MoMA/P.S.1 Young Architects Program has challenged emerging architecture firms to temporarily remake the P.S. 1 courtyard within strict limits of time and budget, serving as a kind of stresstest of the state of contemporary architectural practice. The issues of our time call for a renewed excitement over the joys of lightness, precision and efficiency. The project transforms the environment of the existing courtyard using an absolute economy of physical material: less material deployed means less mass transported to the site; less material discarded at the end of the summer, and a minimum of resources consumed in the processes of manufacturing, fabrication and removal. Beginning with the ideal of a cloud, the lightest and most economical source of summer shade, the project uses air as a structural medium to inflate and suspend diaphanous volumes of ultra-lightweight PVC/nylon fabric over the concrete and gravel courtyard. The geometric form of the torus, a perfectly efficient pneumatic shape, provides the basic unit that is repeated, interlinked and modulated to form a hovering cloud.